Jeanne. Fox served as a commissioner of the New Jersey Board of Public Utilities for 12 years and was its president and a member of the governor’s cabinet from 2002 to 2010. Under commissioner Fox’s leadership NJBPU became a leader among states in developing cutting-edge clean energy policies, and promoting renewable energy and energy efficiency. 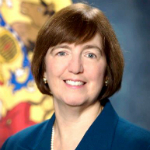 Ms. Fox served as regional administrator of the United States Environmental Protection Agency Region 2 and as commissioner and deputy commissioner of the New Jersey Department of Environmental Protection and Energy. Ms. Fox is a co-founder and board member of the nonprofit Center for Renewables Integration. She has received numerous state and national awards in recognition of her innovative and effective leadership and is a member of many boards and commissions.